What causes a sugar addiction? Is it too much of a good thing gone awry? Candida? Maybe we can blame our hormones? Whatever the cause, many of us are slaves to sweets — which sabotages our thoughts, our dental health, our gut ecosystem, and our overall wellness. I've been there. My own sugar addiction originated all the way back in the 1990s, when I thought that fat was bad and sugar was simply free calories. Over the years, I'm sure non-fat treats played a role in my illness and pathogen overgrowth. So how do we loosen sugar's hold on us once and for all? In my late 30s, with dangerously bad health, I finally started a grain-free and refined sugar-free diet. It took 3 full years for my sugar addiction to go away. I never cheated, but I still craved what I could not have. Over time, I've figured out certain choices and steps that aided in my process of recovery. Now, my sugar addiction is gone, and the cravings have never returned! I hope these insights will make your journey as successful as mine — and much faster. 1. Increase your fat intake. When overcoming my sugar addiction, this was my single most powerful tool for killing the craving. We have wonderful local, pastured pork available in our town. I ate lots of sausage patties and eggs cooked in lard or butter — they satisfied me. I used to meander down the ice cream aisle at our local grocery store on a regular basis. Or I'd make homemade ice cream. When I realized I had pathogen overgrowth (see #3), I stopped buying or providing myself with this treat. The elimination of sugar, and even honey (for a time), helped to destroy the pathogens. Without any sweets to eat, I began to stop (it was a process!) thinking about dessert. Eventually, I stopped altogether. Now my kids think I'm boring and wish I'd get my sweet tooth back! 3. Have your stool tested to see whether or not you have pathogen overgrowth. If you have pathogen overgrowth, often referred to as candida, these invasive organisms may be calling the shots in your body. Pathogens feed on sugar. Our bodies are largely comprised of microscopic critters, so yes, they can affect our cravings — as creepy as it sounds! Here's how to bring back internal balance. 4. If you have leaky gut, consider supplementing with N-Acetyl L-Cysteine. Often, sugar addictions and leaky gut go hand-in-hand. N-Acetyl L-Cysteine, a precursor to glutathione, is an important building block for the cells that line the gut. I took 900 milligrams daily for 3 months, then stopped. In the end, this was the amino acid supplement that helped to seal my own gut. Please note that long term use of N-Acetyl L-Cysteine can lead to a histamine intolerance. 5. Finish your meal with a strong fermented vegetable. There's nothing like a salty pickle or a tart mob of sauerkraut to make you feel finished. The addition of these probiotic-rich savory foods also helps to restore inner balance to your gut's ecosystem. I haven't swallowed a single bite of sugar in 5 years. How? I created alternatives as needed so I never ran back to old favorites. In my sugar-free cookbook, many of the recipes use or can be adapted to use stevia or hardwood xylitol (see #7). This means there's zero chance of feeding pathogens. 7. Consider stevia and hardwood xylitol. I began my healing process with both honey and stevia in my diet. However, my pathogen overgrowth was so invasive, I eventually had to give up not only honey, but many sweet vegetables as well. I sweetened tea with stevia during this time, and occasionally made a treat with xylitol when the textural needs of a recipe demanded it. Xylitol is controversial enough that I eliminated it as soon as I could tolerate honey and maple syrup again. Xylitol is a high-FODMAP food that causes fermentation and gas in sensitive individuals. It may or may not be helpful to your body. It was a temporary helper that I don't regret. By the time I tackled my pathogen overgrowth and sealed my leaky gut, my sweet tooth had disappeared. I no longer thought of sweets from the moment I woke up in the morning until my last dessert of the night. And now, I'm well enough to enjoy treats without craving them or eating too many. I use maple syrup, raw honey, and stevia — all in moderation. What about your journey? 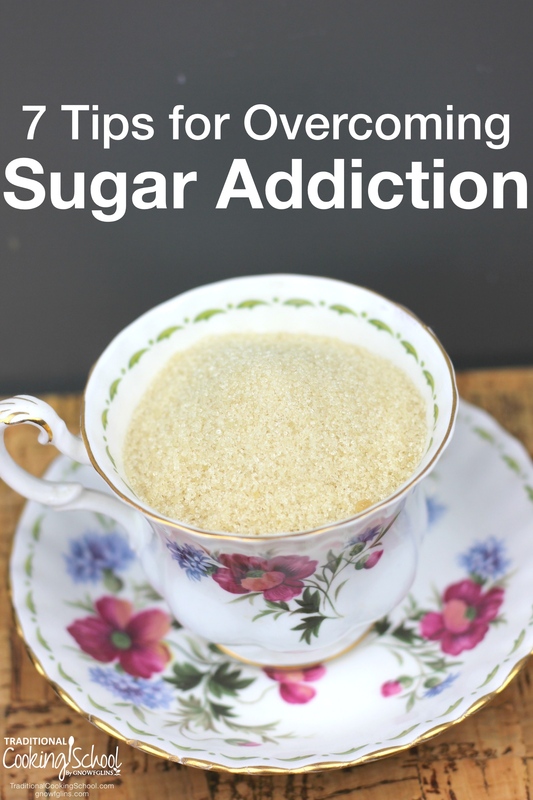 Are you struggling to give up sugar or sweets? P.S. 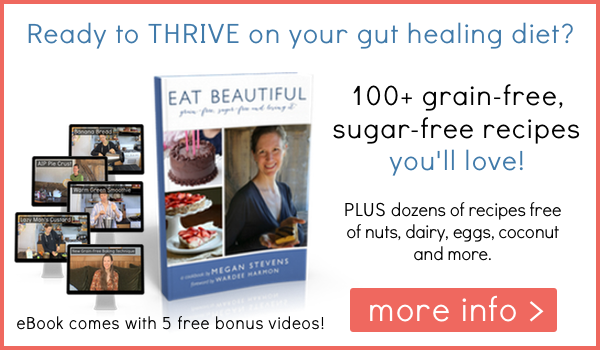 Would you like some tried-and-true recipes without sugar to get you started on breaking sugar addiction forever? Any suggestions for kicking the sugar habit if you are allergic to fermented foods, I have a yeast, mold and fungus allergy, they can cause my throat to swell shut, trigger horrendous migraines,give me loose stools , severe stomach pain, upset and the list goes on, post migraine is my biggest carb sugar craving time and since I’m chronic, pretty much daily migraines, sugar is a staple in my diet, favorite forms are ice cream, sherbert, and chocolate……not a big bread eater because of yeast allergy, and egg allergy, but I do like an occasional muffin, egg free homemade ones….I seriously need to kick this sugar habit, pounds are packing on, not a good thing, help…. Hi Kay, sorry to hear of your struggle! I would still recommend you implementing the other tips. Although you can’t eat sauerkraut you can still substitute in stevia and hardwood xylitol. 🙂 You can still stop buying all sugar, so it’s not even in your house. Set a date to start; clean out your pantry and fridge; don’t buy sugar treats at the store; and … begin to make your own! 🙂 Having alternatives is so helpful! Blessings! Also, notice my cookbook, or seek out free recipes online. There are many great sugar-free recipes available thankfully. Alternatives are the key.